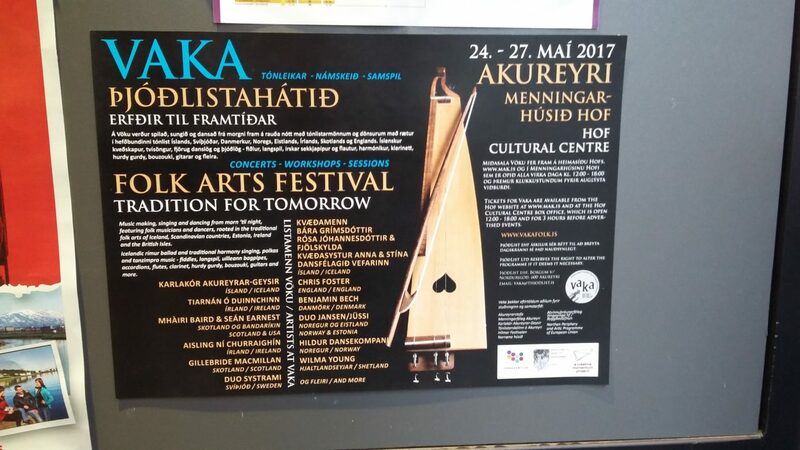 Based in Akureyri, North East Iceland, the five days of this year’s Vaka Folk Arts Festival incorporated a series of concerts, workshops, sessions and a seminar. With the support of a creative momentum project a number of creative professionals from the music sector participated in Vaka. From Västernorrland in Mid- Sweden these were Duo Systrami and Kristina Sandberg. Tiarnán Ó Duinnchinn, Mharhi Baird and Aisling Ní Churraighín attended from the west of Ireland and from Northern Finland Eetu Suominen and Oula Guttorm participated. This year’s seminar assessed the role of festivals in the preservation of folk music. Also from the west of Ireland, Dr. Verena Commins attended Vaka with National University of Ireland (NUI), Galway and discussed her research on the Willie Clancy Summer School. Verena’s work identified how the Willie Clancy Summer School has played a valuable role in the preservation and future practice of Irish traditional music. It also plays a strong part in the image associated with Miltown Malbay, the west Clare town where the summer school takes place each year since 1973. Tunes taught at the festival are carried forward and played elsewhere by the local and international participants. The summer school has a strong underlying ethos of volunteerism and is deeply embedded within the local community. The approximately 20,000 visitors the summer school attracts each year should present an infrastructural challenge for the town. However instead the existing spaces of Miltown Malbay, its homes, pubs and schools, become places of teaching. The summer school has literally brought Irish traditional music back home. Verena explains: “Due to a shortage of space one year, people opened up their living rooms to hold uilleann pipe classes – and they’ve been happening ever since. So the summer school brings domestic music-making back into people’s homes where it traditionally emerged from”. The Willie Clancy Summer School also brings wider benefits to the town. It has resulted in traditional music being strongly associated with it and this attracts visitors outside of the summer school’s ten day duration. Miltown Malbay’s location also adds to the sense of authenticity surrounding the event. Its peripheral geography on the west coast means it also becomes associated with the west of Ireland which can be constructed as a ‘place apart’. According to Verena historically: “The west of Ireland has been imagined as an untainted cultural heartland of language, music and literature”. The Vaka seminar also featured other speakers who provided insights based on their experience and research. Aisling Ní Churraighín, also from NUI Galway, talked about folk music traditions and festivals in south-west Donegal assessing their influence on the communities in which they are held. It also featured presentations based on experiences from Northern Finland. Oula Guttorm producer of Ijahis idja, the Sámi music festival in Inari, discussed how this festival combines both traditional and contemporary Sámi music, as well as other events such as workshops and competitions to broaden the festival’s appeal. Eetu Suominen from Northern Sound explained the challenges, but also the unique experience provided by a peripheral music scene. Now in its fourth year, Vaka Folk Arts Festival focuses on music performance. However the seminar provides a valuable opportunity to combine practice with research and reflection.